Nigerians have been urged to support educational reforms and hold government responsible for providing education for all especially the youth so as to curb social vices. This was the submission at the tenth annual Founder’s day celebration of the American University of Nigeria in Yola. 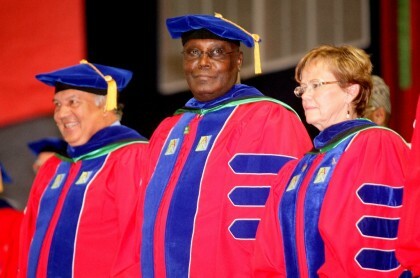 The Founder, former Vice President of Nigeria Atiku Abubakar describe education as invaluable and key to unlocking opportunities, prosperity and progress of every nation. He commended the school for its resilience in continuing with academic activities in the face of the security challenges threatening the region. The institution which is Africa’s first development university is uniquely modeled to teach its students how to analyze and tackle challenges within their environment. Literacy as well as Feed and Read Campaign which will impact lives of thousands in the community are programmes developed to achieve this goal. The ceremony which coincided with the founder’s birthday featured presentation of awards to outstanding students and staff.